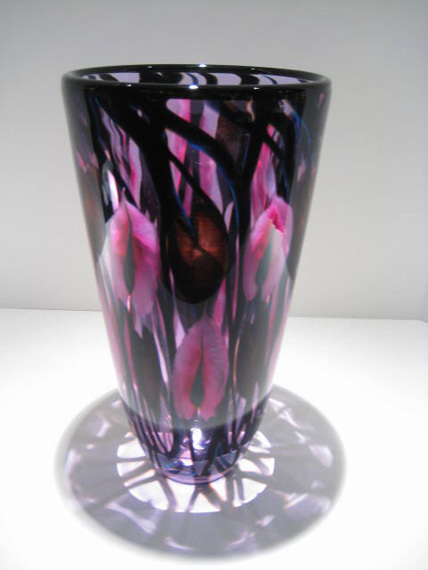 Daniel Lotton is the son of world renown glass artist Charles Lotton. Born into an artistic family, Daniel was encouraged to express his creative energies. At the age of 14 he started working in Charles’ Lynwood glass shop learning to make pendants and paperweights. At the age of 17 he started doing Charles’ finishing work which consisted of grinding and polishing glass. He later assisted and apprenticed Charles for several years. When Daniel graduated high school he started working full time in the studio for Charles as well as creating his own glass. As his skills grew so did his commitment to his art. Through the years Daniel has grown into the artist that he is now today. A constant throughout his career and his work is the inspiration he derives from nature. Some of those designs that he has created over his career is his Pulled Fern design, Anthuriums Flowers, Tuliptokiss Flowers, Iris, Asters as well as his signature Cynthia Flower. Surely these will stand the test of time in the art world. Examination of any Daniel Lotton art from paperweights and perfume bottles as well as vases, lamps, and chandeliers will inevitably communicate his desire to emulate the Master’s great hand in every laboring creation. Daniels’ passion for glass has changed throughout the years.Daniel spends many hours sketching new designs, perfecting color formulas to personally execute those ideas to keep his art progressive. At the present time he is captivated in creating beautiful lighting, such as lamps, lighted tables as well as chandeliers. He creates beautiful custom lighting for collectors as well as businesses. You can find Daniel’s studio surrounded by farm fields in the quaint town of Crete, Illinois. Daniel’s unique one-of-a-kind pieces can be found in many fine galleries across the country. His work is collected by art enthusiasts, celebrities, and prominent sports icons both nationally and internationally. NASCAR Champion Tony Stewart, Grammy Award Winner Singer Melissa Etheridge, and Actress Salma Hayek are just a few of the prominent collectors of Daniel Lotton’s Art Glass. Assuredly, Daniel Lotton collectibles will be enjoyed by many generations to come.